We have been slow to recommend a “best of” the current spate of Black and White photography technique books, as there are many fine ones out there. 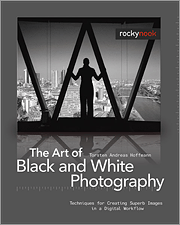 Torsten Andreas Hoffman’s “The Art of Black and White Photography” is a gem of a guide into the very different world of Black and White image making, illustrated by his fine art quality photos. Hoffman’s book is an approach all its own with a real in depth exploration of how to “see” in Black and White. After introducing the ground rules of composition, the author illustrates their applications with various photographic genres such as architecture, street photography, portraiture, and surreal photography with his own stunning black and white images. In the second part of the book, Hofmann illustrates the elements of a photographic language , which distinguishes creative photography from random shooting. Though now two years old (with references to CS3) this book is very contemporary in its recommendations. For those wanting to improve their approach to shooting Black and White images or learning how to appreciate the craftsmanship of great photography … we highly recommend this book.